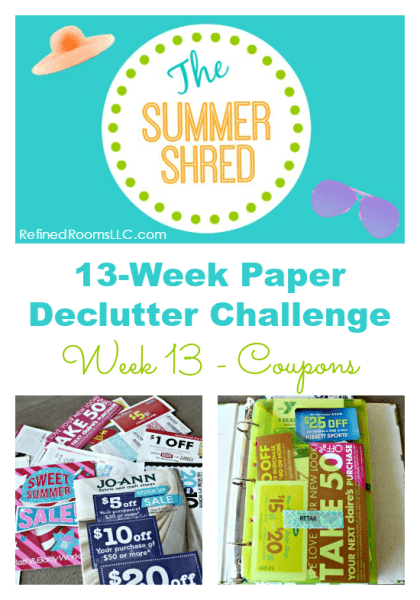 Welcome to Week 13, which is all about organizing coupons! 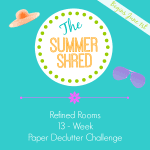 You made it to the finish line of the Paper Declutter Challenge. Hundreds of you have joined me on the journey, and I’ve smiled each time one of you has shared your stories and photos that document the progress you’ve made towards reducing the paper clutter in your homes. Perhaps you haven’t had the opportunity to tackle each paper category just yet. Celebrate the progress you’ve made up to this point and make a plan for when you will get to the categories that remain. Half the battle is changing your mindset regarding the need to keep all of the paper. The other half is putting systems in place and changing your habits. If participating in the Challenge has helped you to change your mindset, you are farther along in the organizing process than you think! 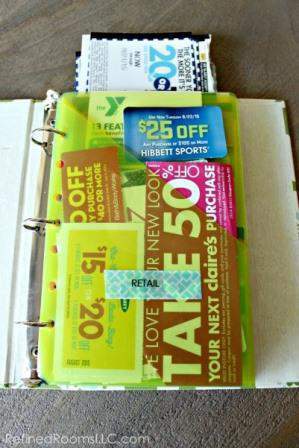 Without further adieu, let’s finish up this challenge by addressing organizing those coupons. 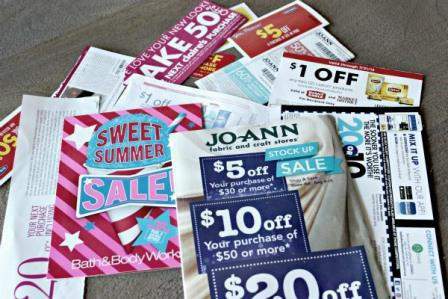 My first recommendation to those of you who really struggle with this paper clutter category is to consider whether you need to allocate your time and energy towards organizing and maintaining coupons at all. A few of my clients have struggled so much with maintaining coupons that they ultimately decided that all of the time it took to collect, cut, and sort was simply not worth the savings they reaped. Today, I officially give you permission to decide “I don’t do coupons”. 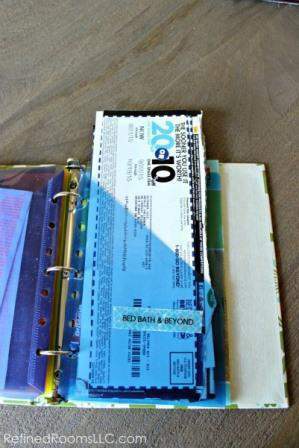 If you decide that the time it takes to maintain coupons is worth the money you’ll save, you may want to declare “Ground Zero” and start fresh by simply tossing out any coupons that have been lingering around your home. Most are likely expired anyways, right? 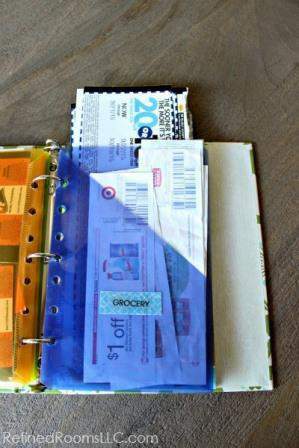 Just like any other piece of paper that flows into your home, coupons should flow through the paper organizing system that we set up in Week 1. 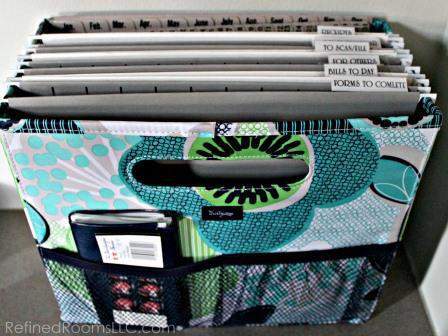 When I empty my inbox each evening, I place any incoming coupons in the “To Scan/File” folder within my action file. Next, you’ll find the Grocery category, which for me, includes coupons that I bring home from Target and my local grocery store for items that I know my family uses. I quickly scan these coupons as I leave the checkout stand, and toss those “useless” coupons in the trash on my way out of the store. The Entertainment category is where I keep the coupons for a free round of Putt Putt or a free day pass to the local zoo. We’ve been accessing this binder pocket pretty frequently this last month of summer vacation! 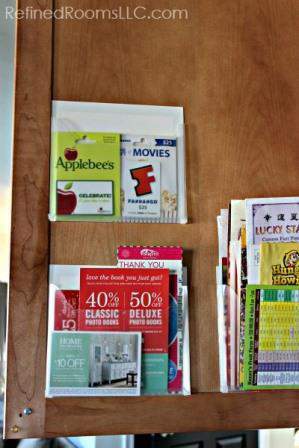 You may be wondering where I keep the coupon binder. 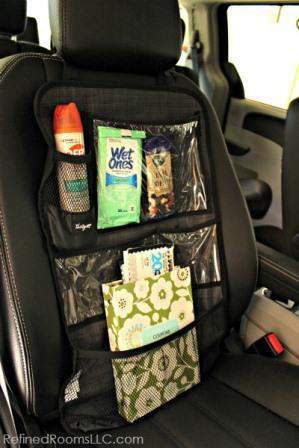 In keeping with the organizing mantra that you should store items close to their point of use, the logical place to store most coupons is in your car, right? That’s exactly where I keep them. Otherwise, you end up having many frustrating moments in the grocery store parking lot when you realize that your coupon stash is on the kitchen counter. With that being said, there is one category of coupons that I DON’T keep in my car…the “Online Shopping” category. Since I’ll need to access these coupons when I’m on the computer, I’ve designated a spot for these in our household command center. 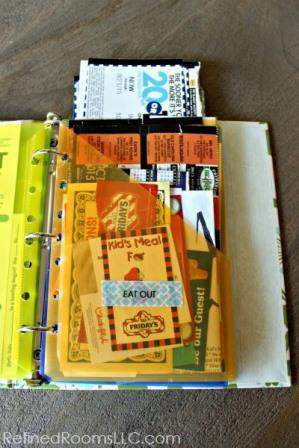 I use one of my favorite organizing products, the Martha Stewart Pantry Pocket, to store these inside a kitchen cabinet (along with our stash of take-out menus and gift cards). While I’m filing the new incoming coupons away into the coupon storage containers each week, I take a few minutes to purge any expired coupons. This weekly maintenance keeps my coupon system lean and mean, and reminds me of “deal opportunities” that I have in my back pocket should the need to make a retail purchase arise. Be sure to come back after this last assignment and let me know how you fared during the challenge (in the comments/”Speak Your Mind” area at the bottom of the page). I’d love to get your feedback regarding how I can tweak the challenge to make it even better in the future! ~ Happy Paper Decluttering Friends! Great post. 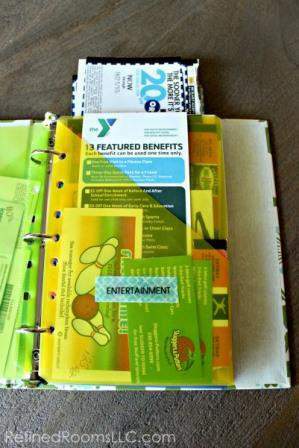 Where did you find that size binder and slash pockets for the sorted coupons? THanks!